In fact, better than well, great! There are a select few moments in every wine lover’s journey, that they drink something so profound that it makes them arrive at a deeper level of appreciation and understanding. 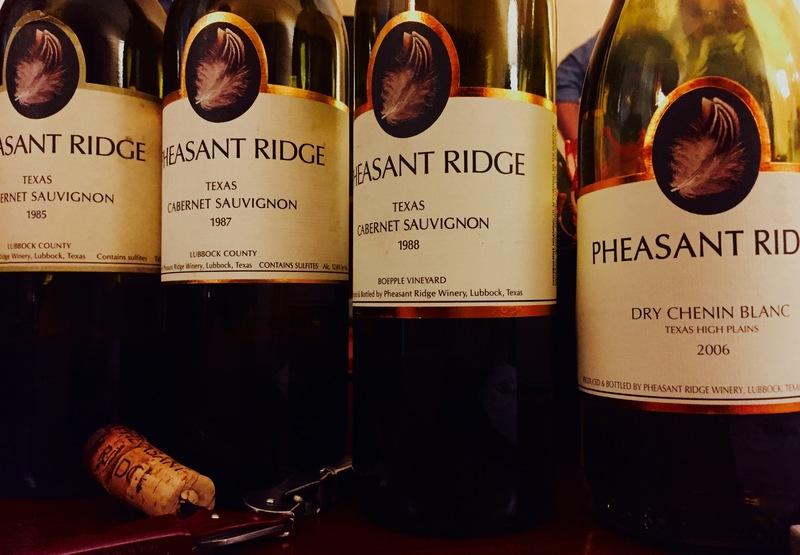 For me, one of those moments came when Bobby Cox of Pheasant Ridge winery presented an opportunity to taste Texas wine history in the form of a 2006 Chenin Blanc, a 1988, 1987 and a 1985 Cabernet Sauvignon. It was one of only a few experiences where my craving for superb Texas wine was achieved. No doubt about it, these wines have raised the bar entirely of what I expect from great Texas wines going forward. The Chenin Blanc would make you guess and reminisce of worldly Vouvray-lifted, honeyed, wooly, floral and spectacular and the Cabernet Sauvignon possessing vintage specific personality that whispered deep, complex notes that simply begged not only to be sipped, but quite possibly to be laid down even further. Those that have an opportunity to learn from these wines will not simply look at them as “old” Texas wine, but rather see them in a much grander light, a light that will open minds, build bridges and make you question what you thought you knew about Texas wine, and in turn turn non-believers into evangelists. These wines maybe from our past, but they represent our future; or at least I hope they do. And as I swirled, sniffed, sipped on and discussed this Texas wine history I became more and more perplexed, not by the “how”, but by the “why”. As in, why don’t we see more of these great wines being produced today in the modern, burgeoning Texas wine industry? Part of it, I think, has to be that we drink Texas wines way too earlier and don’t give them the opportunity to develop into these rich, complex and nuanced wines that tell a story. The other side of the coin are the volumes produced, which are based on a host of climatic and economic limitation. But even then, where are the great Texas wines of the 1990s and early 2000s? Did we drink them all? Are they sitting in a library somewhere? What else can we learn and what other bridges can we build? We hear a lot of back and forth within industry circles about what the identity of Texas wine is and what our future brand will be, but the more we push for a definition, or an absolute for Texas wine, the more we realise that we are far from it. We produce an incredible range of wines, and really have only just begun to discover what our magic is. Examples like these Pheasant Ridge wines are, but one example of what is and what can be the Texas wine story the rest of the world will hear and experience. A very special thanks to Bobby Cox of Pheasant Ridge winery for this walk through Texas wine history.